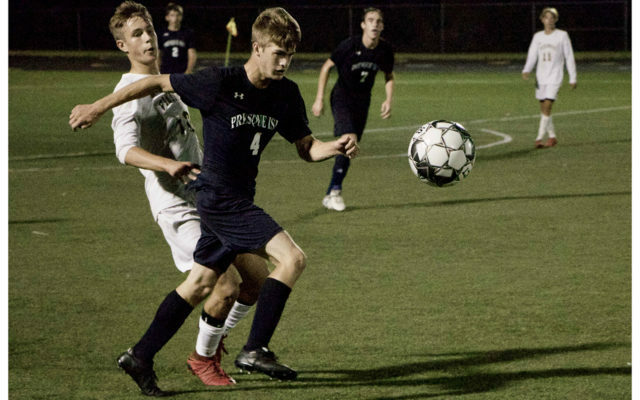 Nothing was settled in the first meeting of the season between the Caribou Vikings and Presque Isle Wildcats, but by displaying some fast-paced, aggressive and skilled play, both soccer teams proved they belong in the upper echelon in the Class B North division. PRESQUE ISLE, Maine — Nothing was settled in the first meeting of the season between the Caribou Vikings and Presque Isle Wildcats, but by displaying some fast-paced, aggressive and skilled play, both soccer teams proved they belong in the upper echelon in the Class B North division. Colby Carlisle scored off a Sam Beaulieu throw-in with 9:50 left in the first half to give Presque Isle the lead. The kick bounced twice in the area before Carlisle ran onto the ball and got it past Caribou goalkeeper Noah Hixon for his team-leading fourth goal of the season. “We’re trying to find a scorer and right now Colby is the one who seems to have the knack for it,” said Presque Isle coach Joe Greaves. The Vikes didn’t wait long to come up with the equalizer as they answered 2:23 later. Both teams mustered ample scoring opportunities the remainder of regulation and during the overtime sessions, but ended up settling for the 1-1 draw during Wednesday’s showdown at the Gehrig Johnson Athletic Complex. Greaves also was pleased with the caliber of play and felt it was a hard-fought battle between two talented teams that happen to be rivals. 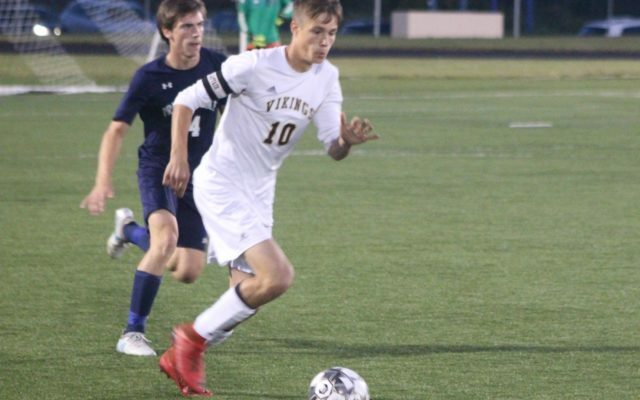 The tying goal was highlighted by an outstanding individual effort by Viking senior midfielder Alex Ezzy, who was a difference maker throughout the evening with his speed, dribbling skills and ability to see the entire field. He dribbled down the left side, making his way past a couple Wildcat defenders, and was able to turn the corner at the end line to get to the near post. Ezzy then shoveled a pass to an open Cullin Caverhill, who buried a shot past PI keeper Mason Young. “Whenever we got the ball in the corner I thought we were really dangerous,” Hunter said. “On that goal, Alex went with speed, got to the corner, turned the corner and saw Cullin, who made the huge finish. Greaves said Ezzy is a special talent who is a major weapon for the Vikes. The Vikings are now 2-1-1 entering Saturday’s home match against Hermon, while the Wildcats sport a 2-0-2 record heading into a road contest against Foxcroft Academy, also to be played Saturday. Caribou was able to create a few more offensive chances than PI during the course of the match. The Vikings took five free kicks within close range of the goal as the Wildcats committed 18 fouls, compared to 15 by Caribou. The visitors also took six corner kicks — three coming in the two five-minute overtime periods — while PI managed five. Hayden Hunter of the Vikings turned in a clutch defensive play midway through the second half. On a Presque Isle set play from just outside the box, Hunter cleared the ball off the goal line to prevent a score. After the game, both coaches acknowledged their opponent with much respect. The two teams now have to wait until Oct. 11 for the rematch, to be played in Caribou.